dial that makes this an easy task. 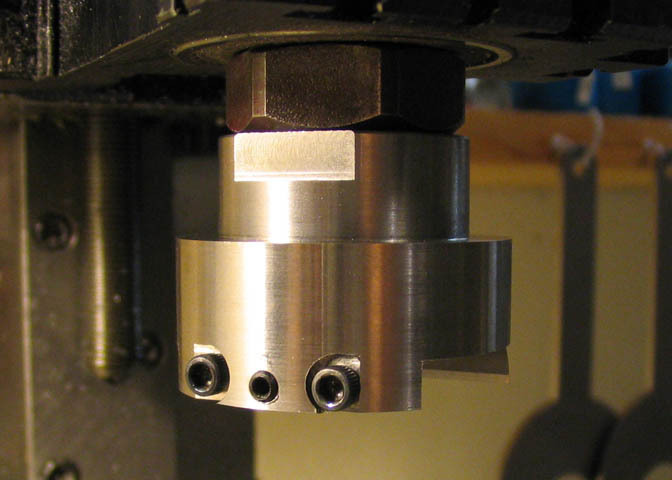 Taig Milling Machine Boring Head Prints. 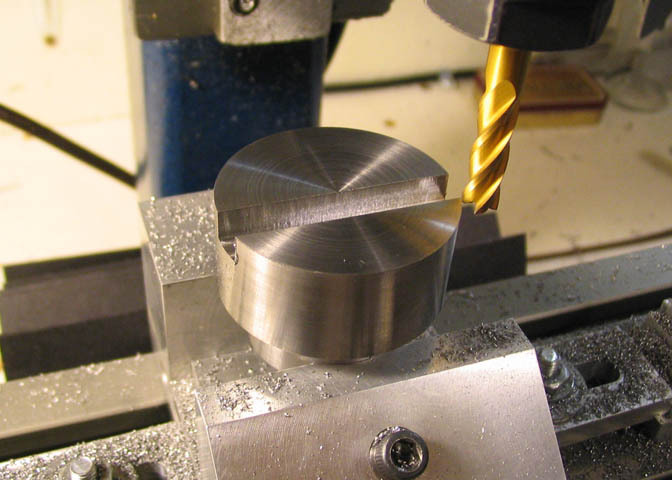 The project starts with a piece of 12L14 CRS round stock, 1 5/8" diameter and 1 1/2" long. was used here, but for this the three jaw would do as well. 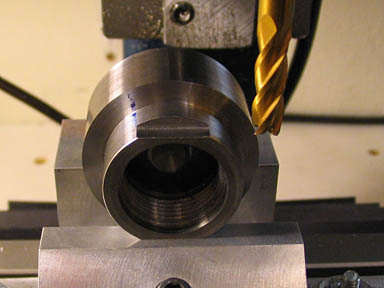 The end is faced off, and a diameter of 1.125" is turned for a length of .600". the size called out in the prints. Not a big deal. Use what is on hand. 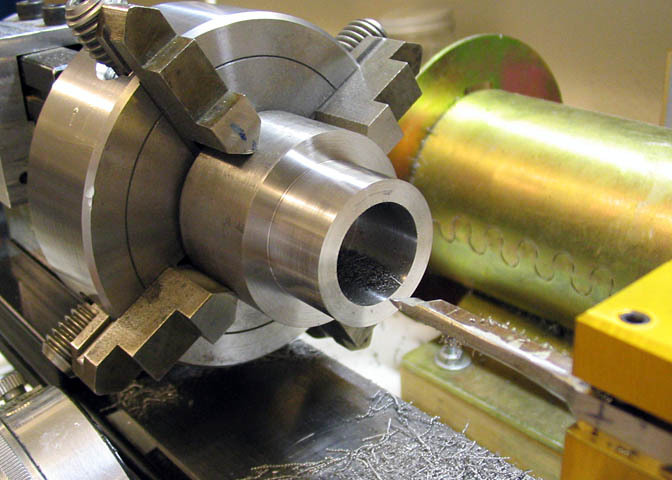 thread, then you need to adjust the size of the bore for threading that pitch. little long and trim back later. used to face the bottom of the hole flat. to within a couple of threads distance from the bottom. happy spending $80-90 for two taps that they will only use once. 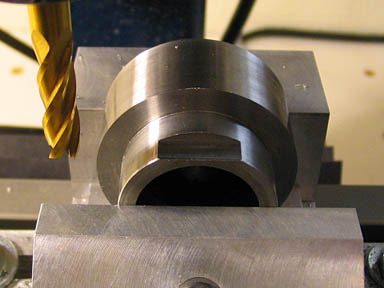 machined surface of the boring head body. 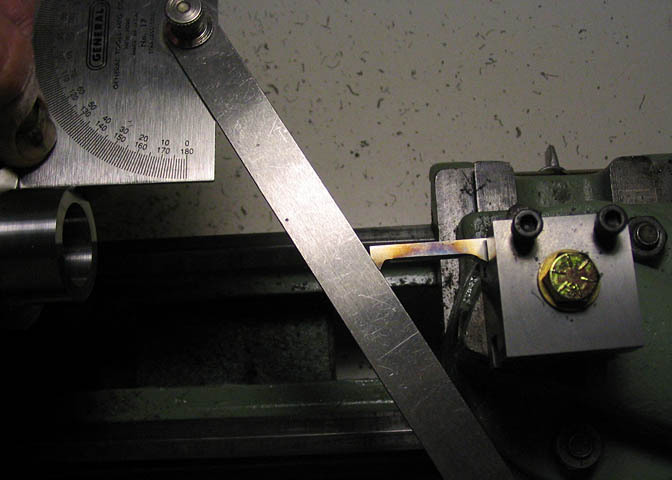 Then the tool can be adjusted to the protractor leg. With the threads cut, the first big step is done. 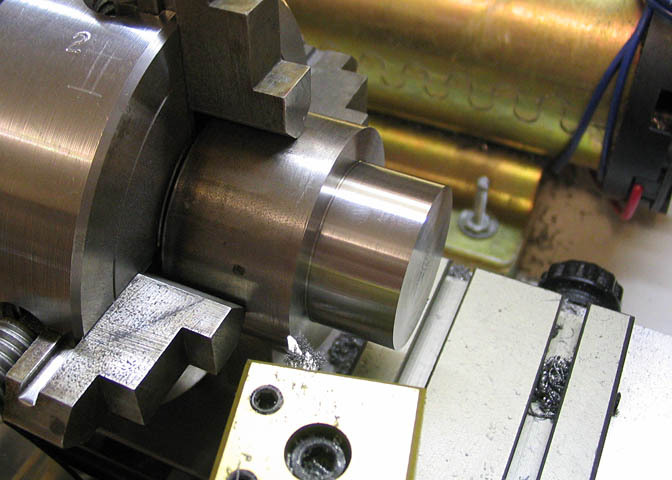 threading lathe without ever disturbing the jaws of the chuck, or the piece it's holding. 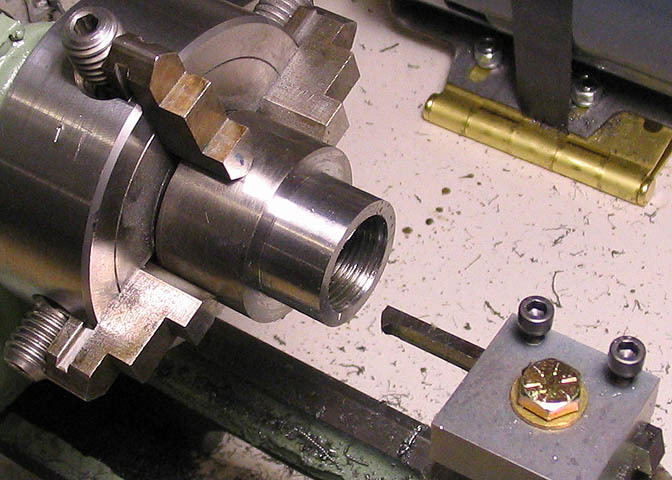 A close up of the internal thread cutter, for the curious. 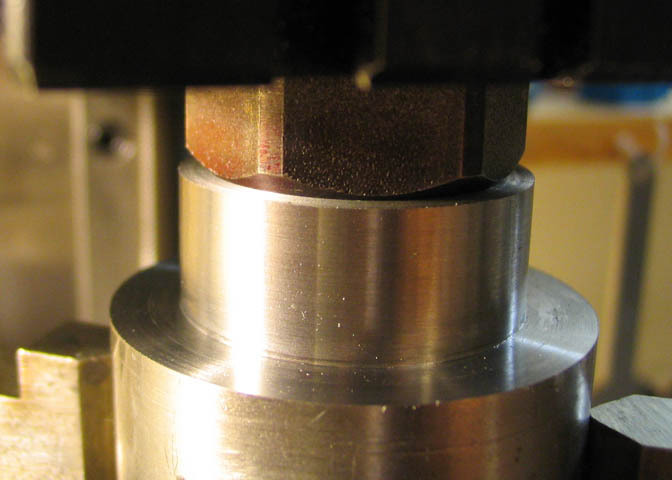 the thread in the body allows it to seat properly on the spindle. 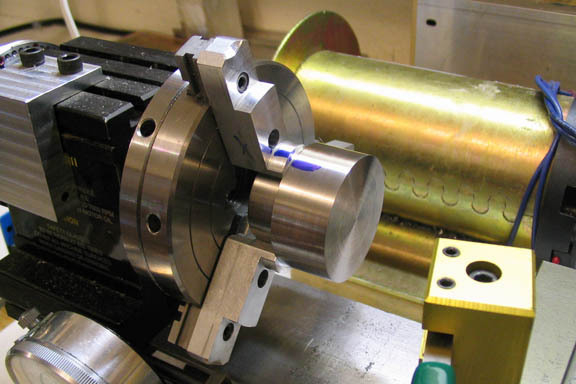 the four jaw chuck. 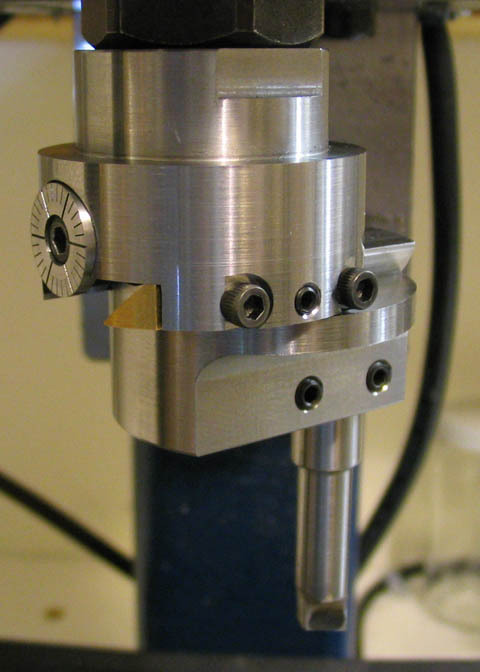 The large end of the body is finished in the three jaw, as seen here. size as the work piece will make the chuck very accurate for that size. look of this over a hex shape. 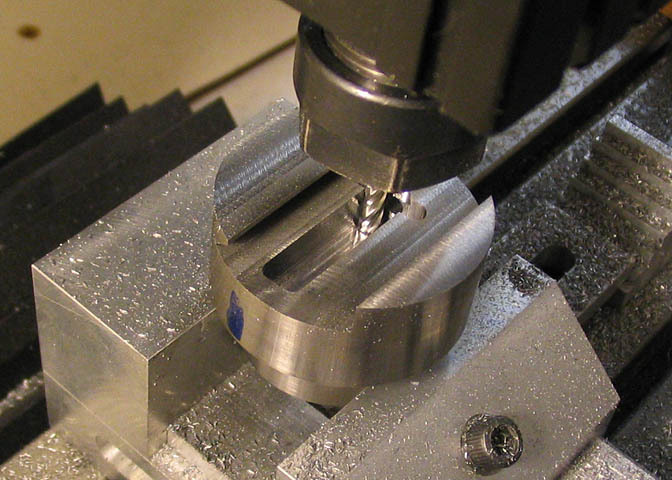 as the rest of the milling steps on this piece depend on it being right. often. 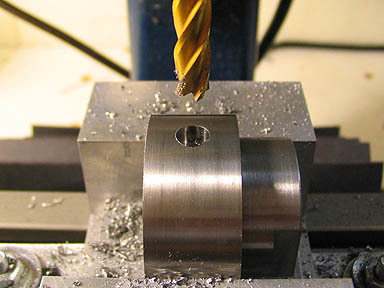 After the first 3/8" or so, withdrawing the bit every .1" should do. 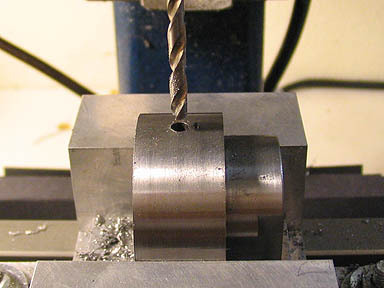 After the hole is finished, a 1/4" end mill is used to make the counter bore according to the print. 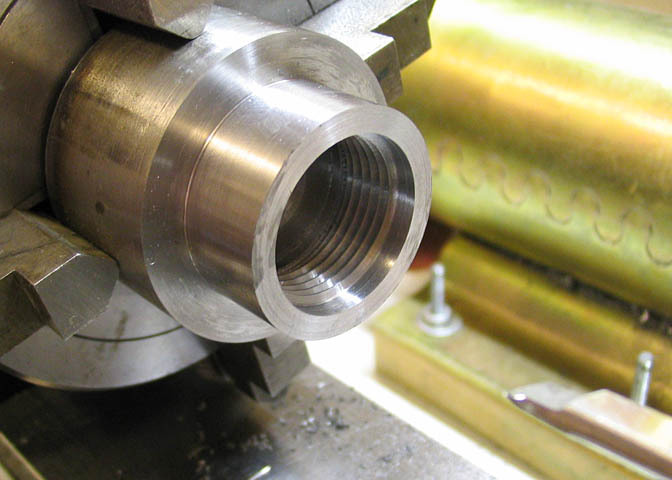 to the depth by whatever excess you allow for finish turning. 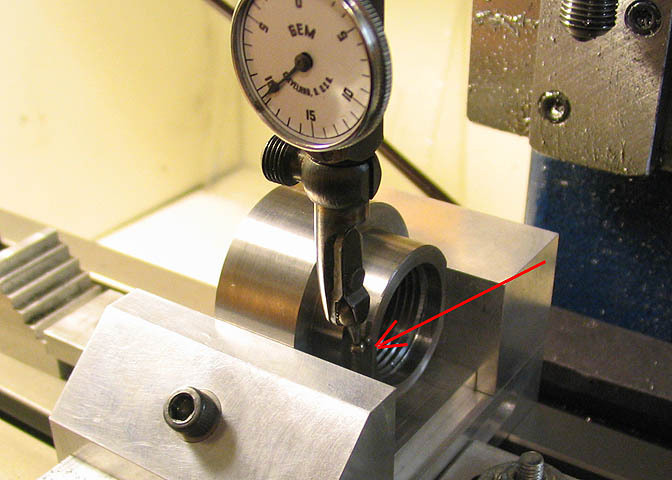 dial reading on the mill tables so you can refer to this starting point as needed. 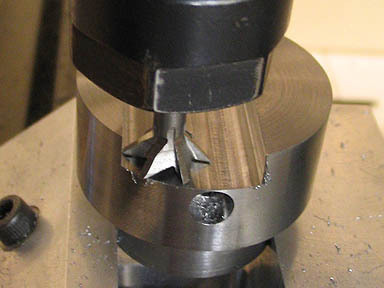 the left surface of the cut out area, the amount of in-feed needed to cut the dovetail can be dialed in. 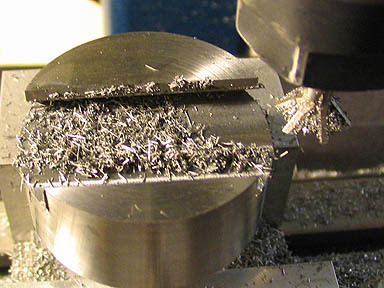 feed side of the cutter rotation. 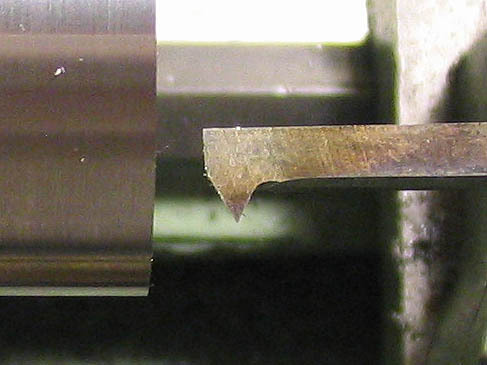 Cut only against the rotation of the cutter edges or you will break your tool. 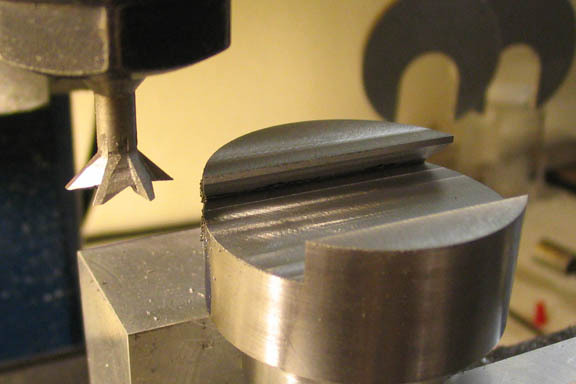 surface of the bottom of the cut out was flat. 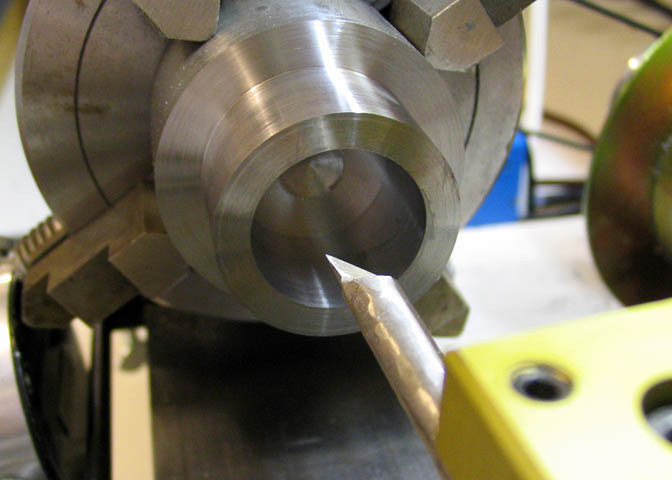 The tool required is a 3/4 dia 45 degree dovetail cutter. Available at any tool supplier. already were, but this is just to make sure. 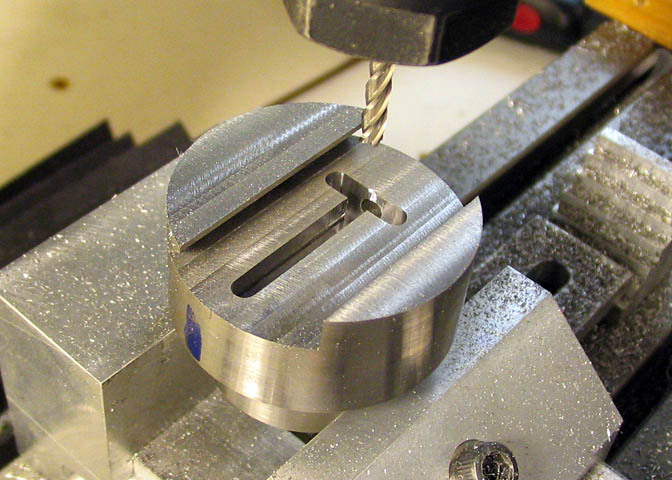 When the dovetail is done the pocket for the nut and lead screw retainer can be milled. 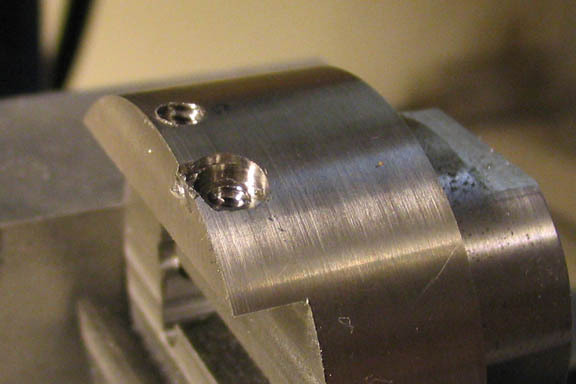 Next step is to drill and tap the holes for the gib screws. to get rid of the bur that has been pulled up. Oh well. At least it wasn't something really serious, like a broken tap.